Feel free to use this free flip chart for “Starlight” when teaching children to sing this song. Believe it or not I have a huge fear of playing in public. This has been one of my most difficult challenges in my passion for playing the piano. I get really bad anxiety when playing in front of others. People laugh sometimes when I say this because I CHOOSE to be a piano performance major in college AND now arrange and perform music as a profession but yet playing in front of people is one of my greatest fears! So, this is something that I am working to overcome every day. But, composing music besides being a wife and a mother is truly one of my greatest joys in my life and so I want to share it with others. When I first starting writing this arrangement of “Where Can I Turn for Peace” I couldn’t get the words of “Lord, I would follow thee” and “I Need thee every hour” out of my head and so I decided to combine all three of these hymns. I believe that the message of the words of these three hymns go together. I know that our Heavenly Father is there for us in our times of trial and that He can bring the peace that we are seeking for. Thank you Kristin Hodson for sharing this! For many of these kids (and some of the adults), they will not know who Sariah is. This is a great opportunity to bring to life the story of a courageous woman and mother who chose courage and faith over comfort and what she had known. Get acquainted with Sariah. You can read directly from the scriptures and you can find a beautiful write-up (with a family home evening lesson) HERE. Start with Nephi’s Courage as an opening song. This will refresh their memories of this story and give context for Sariah. Briefly, recap Nephi and the stories of that song then ask the kids if they knew that Nephi had a mom. And who was she? Introduce Sariah and tell her story pulling from THIS write-up. Use the flip chart to introduce Sariah and her role in the story of Lehi, Nephi, Laman, Lemuel, Sam, and her Daughters. Each picture in the flipchart can serve as an opportunity to teach a gospel principle. Can you tell me about a time when you had to do something you didn’t want to do? How did you feel? (This can be anything from “I didn’t want to brush my teeth, to moving to a new neighborhood, to talking in front of people) Connect them to the emotions of doing hard things. How do you feel when you have made a choice you know Heavenly Father is happy with? What does it mean to have faith and courage? How do we show our faith? 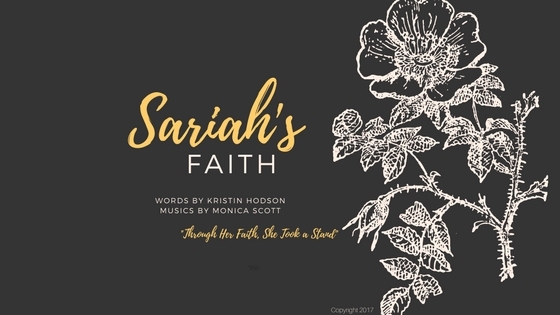 Sariah’s Faith was born by two women, Kristin Hodson, a mental health therapist, and Monica Scott, a career songwriter and pianist. Both mothers, wives, and women trying to fulfill what God would have them do. This song is our opportunity to teach about Sariah, an incredible woman and mother filled with courage, hope, strength, faith, and patience. Kristin’s journey into music wasn’t planned but came by opportunity. In 2012, Kristin was called as primary chorister after meeting with a member of her Bishopric. Her initial response was shock, followed by laughter, followed by, “You know I can’t read music, right?” Without missing a beat, the first counselor said, “We aren’t calling you for your musical talent, we are calling you for your enthusiasm.” Kristin looked him in the eyes and told him she had plenty of that and would love to accept the call. After being in the Primary the last five years, both as a chorister and in the presidency, Kristin kept feeling a void and a persistent question of, “Where are the women in these songs?” She wanted the little girls and boys in her church to learn about and know of the strength that exists among women in the gospel. In the fall of 2016, she came home feeling frustrated and discouraged, wondering when her girls would get to see themselves and internalize the strength of female scripture heroes. This frustration ultimately led her to read about Sariah, the mother of the first family of the Book of Mormon; a complex, dynamic and familiar Book of Mormon family. Through her reading in the Book of Mormon, words started coming into her mind. In about 15 minutes she had an entire page of words. At the time she thought it was just a nice poem but later realized they could be lyrics to a song; lyrics to a song that had answered the hurt and sorrow of her heart over the past few years. Ultimately she thought getting the words put to music could be something nice for her family. Despite this initial inspiration, she didn’t know what or where to go next, due to not being in the music industry. Months passed and then In the spring of 2017, she was prompted again. This time it was, ”What are you going to do with that song?” She still had no idea, so she reached out to a ward member who was in the music industry named Paul Cardall. He pointed her to a Facebook page where she could share her lyrics and see if she could find someone willing to put it to music. Within a few hours, Monica Scott said she was interested. Kristin has since become aware of what an incredibly talented musician Monica is. Monica saw Kristin’s Facebook post and she immediately loved Kristin’s idea and so responded that she was interested in putting music to her words. But Monica was conflicted because just the day before she had told her husband that she was going to take a little music break. Her husband had just accepted a job out of state and she needed to prepare her family for a big move on her own. Monica told Kristin that if something came to her, that she would let her know. Monica said a prayer that morning and felt that if it was meant to be, something would come. Kristin sent her the lyrics, which she LOVED. They were so simple, yet so powerful. Later that day, as Monica drove her children to their various activities, schools, etc., she kept thinking of the words and a little tune popped into her head. Monica remembers singing it throughout the remainder of that day and deciding whether or not she could take on this project. At one point, her 5 year old son asked, ”Mom, who is Sariah?” It was at that moment that Monica knew that she had to write this song. She realized that her kids knew about Lehi’s family–but did not know as much about the wife and mother of this family. She sent Kristin the music that same night. Kristin immediately responded that it was perfect. Over the next month as Monica was preparing for her move and packing boxes, she was able to ponder about Sariah and what it must have been like for her to leave her home in Jerusalem to move to the wilderness with her family, and the amount of faith that it would have taken. Monica thought of the times that she, herself, had questioned and had fear of what they were doing and if it was the right thing for her family. She also thought about how SIMPLE and luxurious her move is compared to what Sariah had to do. Monica pondered Sariah’s faith as a mother and a wife and has had her own faith strengthened by thinking of Sariah’s faith and courage as a woman of God. Kristin and Monica feel that finding each other was nothing short of a miracle. Within 24 hours, a rough version of “Sariah’s Faith” was born and they had a song. Kristin shed so many tears because she felt that her heavenly parents were speaking directly to her heart. Thanks to Monica and her detailed ear, she kept perfecting the music. She showed it to her talented mentors and just like a rough piece of clay, shaped the song into its final form. Sariah’s Faith was shaped by inspired hands for its final project. They like to say they created the words and music and that the entire project was orchestrated by God. What started out as a moment of inspiration on a Sunday afternoon has turned into a bigger gift than we could have imagined. In the short time we have had this song, we have been able to teach kids about Sariah and put a name to the mother of Nephi, Sam, Laman and Lemuel. We hope you enjoy this song and the opportunity this song provides to teach about a female hero in the Book of Mormon, courage, faith, having to leave our comfort zones, trusting in God and the plan of Salvation. Last June, Monica Scott had the idea to write a song for her children to sing in church. One morning during an early morning walk through the cemetery, Monica contemplated different ideas for the song. 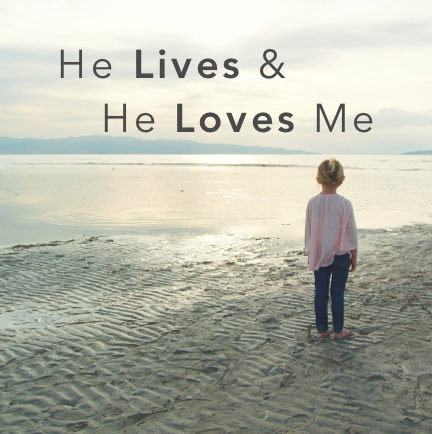 While thinking of the song and the message of what the song to be about, this peaceful melody and the words “For I am a child of god, Child of a King” came into her head. She hurried and recorded herself singing the tune to this serene melody and those words into her cell phone. Once she was home she began playing it on the piano, but felt like it was missing something. The next day, Monica happened to run into a friend who she hadn’t seen in awhile, Anji Branch, at their kids’ swim lessons! They began talking about their music writing hobbies when Monica shared this song that she was working on. Anji immediately shared how she had always felt like there should be another “I am a child of God” song and was equally passionate about this project. Monica sent Anji the music to the verse and what she had written for “For I am a child of God, Child of a King”. Anji pulled it up the next morning and the rest of the lyrics to the song came through within about 45 minutes. Adding lyrics to the music Monica had created for the verse came through almost effortlessly. She shared them with Monica, and it was exactly what Monica had been wanting for the song. That afternoon, Anji was sitting at her piano and playing what Monica had for the chorus. She felt the second phrase “child of a King” should hit a high note on King to relate that God is the highest, so she rewrote the music to the second line and then wrote the rest of the chorus to go with the lyrics she had written earlier that morning. Although reluctant to send the change, Anji sent the completed chorus to Monica to get her opinion. Monica shared it with our mutual and musically-gifted relative who liked the chorus, and the song was pretty much completed. Because it came out so quickly, they wanted to make sure nothing was missing, but were stumped. After a couple of months of playing around with additions, they took it to Greg Hansen who offered valuable feedback and said the addition was not necessary. They realized they were stumped because the song was already where it had needed to be. Monica and Anji both credit Heavenly inspiration for the existence of this song and are grateful to have been vessels for it. I feel like the all of the songs that I write have a story behind WHY they were written and I would like to share it with all of you. I feel like the stories are what makes the music. Thank you for all of your support.